Frankfurt is the largest financial centre in continental Europe. 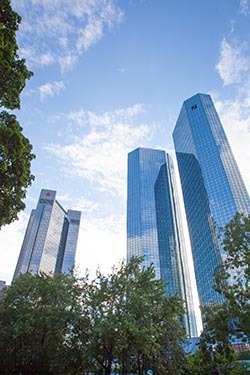 It is home to the European Central Bank, Deutsche Bundesbank, Frankfurt Stock Exchange and several large commercial banks. 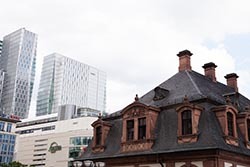 The Frankfurt Stock Exchange is one of the world's largest stock exchanges by market capitalization and accounts for over 90 percent of the turnover in the German market. 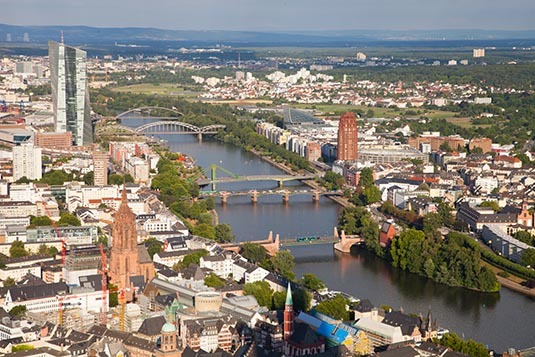 Due to its central location within Germany and Europe, Frankfurt is a major air, rail and highway transport hub. Frankfurt Airport is one of the world's busiest international airports by passenger traffic. 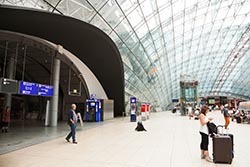 Frankfurt Central Station is one of the largest rail stations in Europe and the busiest junction operated by Deutsche Bahn, the German national railway company. I had less than 3 days to explore Frankfurt and the region around. I was booked at Hilton Frankfurt Airport. Actually, staying over there made good sense since downtown Frankfurt is just 15 minutes away by train. The train station is just below. From the hotel we could walk to the airport as also the trains (S Bahn). We checked in at 1 PM. By 3 in the afternoon we (my son Anuj was with me) were ready to explore Frankfurt. Since on the plan was to explore Romer (the old town) we just purchased a return ticket costing EUR 5. We alighted at Taunusanlage and began our walk towards Romer. Frankfurt has many high-rise buildings in the city centre that form the Frankfurt skyline. It is one of only a few cities in the European Union to have such a skyline. Because of the city's skyline, Germans sometimes refer to Frankfurt as "Mainhattan", a combination of the local Main River and Manhattan. 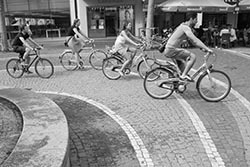 Of course, we did not use the shortest route, rather we zig-zagged through many a streets and squares admiring the landmark buildings, the opera house, churches, Bockenhmr Street, An Der Hauptwache Square and Holzgraben. 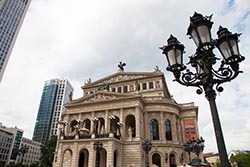 The Alte Oper is a former opera house, hence the name "Old Opera". It was built in 1880 by architect Richard Lucae. It was one of the major opera houses in Germany until it was heavily damaged in World War II. Until the late 1970s, it was a ruin, nicknamed "Germany's Most Beautiful Ruin". Public pressure led to its refurbishment and reopening in 1981. Today, it functions as a famous concert hall, while operas are performed at the "new" Frankfurt Opera. Saint Bartholomew's Cathedral (Dom), is a Gothic building constructed in the 14th and 15th centuries on the foundation of an earlier church from the Merovingian time. From 1356 onwards, kings of the Holy Roman Empire were elected in this church, and from 1562 to 1792, Roman-German emperors were crowned there. It is the city's main church. Since the 18th century, St. Bartholomew's has been called "the cathedral" by the people, although it was never a bishop's seat. In 1867, it was destroyed by fire and rebuilt in its present style. It was again partially destroyed in World War II and rebuilt in the 1950s. Its height is 95 meters. The cathedral tower has a viewing platform that�s open to public. Saint Paul's Church (Paulskirche) is a national historic monument in Germany because it was the seat of the first democratically elected Parliament in 1848. It was established in 1789 as a Protestant church, but was not completed until 1833. 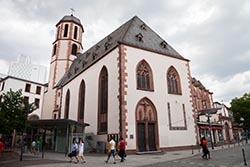 Its importance has its roots in the Frankfurt Parliament, which met in the church during the revolutionary years of 1848/49 in order to write a constitution for a united Germany. The attempt failed because the monarchs of Prussia and Austria did not want to lose power. In 1849 Prussian troops ended the democratic experiment by force and the parliament dissolved. Afterwards, the building was used for church services again. St. Paul's was partially destroyed in World War II, particularly its interior, which now has a modern appearance. It was quickly and symbolically rebuilt after the war; today it is used mainly for exhibitions and events. Although today "Hauptwache" is mostly associated with the inner-city underground train station of the same name, the name originates from a baroque building on the square above the station. The Hauptwache building was constructed in 1730 and was used as a prison, therefore the name that translates as "main guard-house". Today the square surrounding the building is also called "Hauptwache" (formal: An der Hauptwache). It is situated in the city centre opposite to St. Catherine's Church and houses a famous caf�. 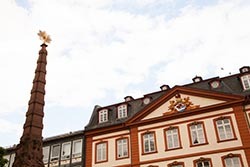 For more than 6 centuries, Frankfurt�s destiny has been directed from the patrician houses on the Romerberg. Like most of her predecessors, the municipal leader lives above the Schwanenhalle, with a view of St. Paul�s Church. The Romer is where the city councillors meet. Many offices reside here, and the civil registry office guarantees a wonderful ambience for weddings. In 1405, the city council purchased the buildings at the Romer from the merchant Kunz. Over the years, nine buildings and several inner courtyards have been added to form the present-day Romer complex. From the beginning the Romer had an importance that went beyond the city. 52 pictures of the emperor in a splendid imperial hall bear witness to the election and coronation of German rulers, and can also be viewed by the public. The National Assembly was to meet here in 1848, but it was moved to St. Paul�s Church because of space considerations. Until 1846, the Romer halls in the middle building served as halls for markets and fairs. Frankfurt�s town hall suffered serious damage in the Second World War. Its reconstruction began in 1945, and it was reopened by Theodor Heuss in 1955. It was not until 1975 that the city restored the Romer�s famous 3-gabled fa�ade to its condition in 1897. In 2004, it was renovated, and a few statues and the �Frankofurtia� were given a new gold coating. The most famous landmark, however, is undoubtedly the Romer balcony, from which many famous people have waved to a cheering crowd. Adjacent to Romer, runs the Main River. Luckily, we could get a cruise operated by Primus Line. 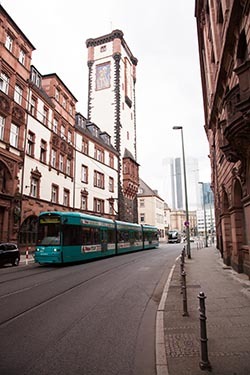 The 50-minute trip sailed along famous Frankfurt landmarks located on both sides of the bank. Namely, the Dom, Dreikonigs (3 Kings) Church, Litrature House, EZB Building, Main Plaza, the Ostaphen and a few stunning bridges. The highlight of cruise was the Frankfurt Skyline. At around 8 PM we returned to our hotel. The next day, we would take a train to Heidelberg and the plan was to return by 5 PM the same evening to be able to explore Zeil and the Observation Tower at Frankfurt. The plan worked to a T.
Thankfully, the sun was out (it had been raining all day in Frankfurt) by the time we reached the Observation Tower. A visit to the 200-metre high Main Tower skyscraper is a must do for Frankfurt first-timers. Finished in 1999, it houses 62,000 square metres of office space, has 2,550 windows, 1090 steps and employs about 2,000 people to keep it standing. The observation platform, on top of building offers magnificent views of central Frankfurt and the surrounding region. The cost to use the lift is EUR 6 per person. After spending about 45 minutes at the observation deck, we walked towards Zeil � a mesmerizing shopping pedestrian-only street. Since the end of the 19th century it has been one of the most famous and busiest shopping streets in Germany. Before World War II it was also known for its grand buildings, but most of them were destroyed and not rebuilt. The western part of the Zeil is a pedestrian zone between two large plazas, Hauptwache in the west and Konstablerwache in the east. These two plazas serve as major intersections for underground trains, trams and buses. Out there, a visit to MyZeil is quite must. It�s an architectural wonder. The MyZeil Shopping Mall covers an area of 77,000 square metres, a structure that includes shops, leisure spaces, kids� areas, restaurants, fitness center and parking. The building is spread over 6 floors, the shopping area from level 1 to the 3rd floor, while from the fourth floor, which serves as a square and meeting place, there are the fitness area and restaurants. The project comes from geography. It's like a river that, from above, has got different depths, reaching the depths of the Earth. The structure of the project stems from a fluid shape that connects the Zeil. Well that was it. Tomorrow we would take our flight to Bucharest � to negotiate the Romanian roads in a Porsche.